Future use-cases of AI for Businesses, PR, Marketing… Technologies aren’t the issue at hand. Education, preparedness, flexibility, learning anew, new skills, and new “Blue Oceans” are the real issues. Global and local economies’ potential will always be about Talent, Opportunities, Open minds, Experimentation and growth, rather than systems. Being for long a Networked Society champion, I was introduced to future-looking and merging technologies concepts. But I was always intrigued by the notion of what the technology tools can enable. What forces can they “liberate”. If the robots do everything, what happens to the human artisans and practitioners? They will adapt because it is a human nature to adapt. Please, don’t take me wrong, but robots won’t take away the unique work of the amazing barista artist Michael Breach, whose real-time portraits in latte foam are remarkable. No bot will win his creativity and authenticity. I’m arguing for long, in my professional domain, that the problem isn’t the Marketing AI advancement, per se, but if are evolving into new directions. So, if the robots, bots, and AI software routine will be doing the dirty work (Customer support, chatting, facilitating automated sales), the Strategist will become the King. In this fantasy narration, as I will be a King-Strategist, the same can apply to all businesses. They can continue leading if only they exploit the best of Technology and head towards new directions. Software powered solutions will only execute on rules developed by human masters. Humans will still hold the steering wheel, as the artists in ways that AI never can be. While humans will adapt to artisanal endeavours, passive income solutions, products of origin, and greater specialization in biotech, energy, sustainability, networked healthcare, social enterprises …with Creativity & Authenticity), the AI will evolve. Robots might take on some human jobs that involve repetitive tasks, but the stakes are greater. PwC projects that AI will contribute an additional US$15.7 trillion to global GDP by 2030, an increase of 14% (China and North America for almost 70% of the global economic impact – you see why we cry loud to Europe, to wake-up?). 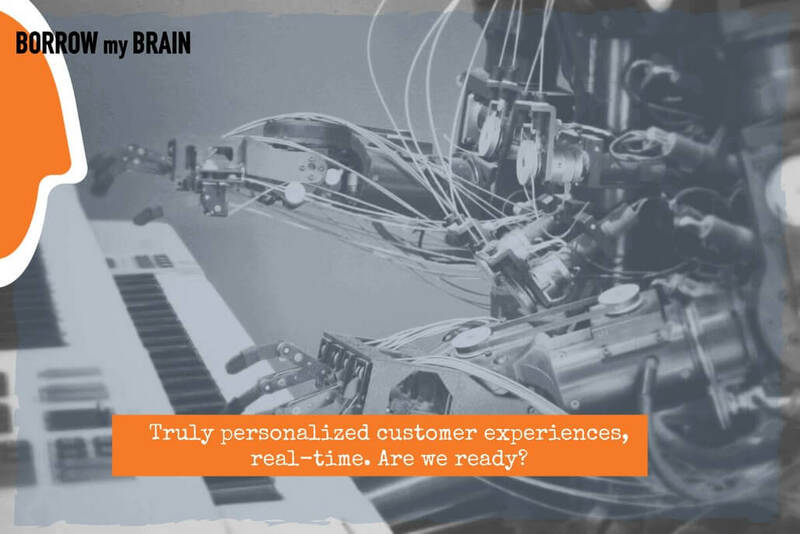 Although Marketers see AI as a buzzword… automated data flows, behavioural “scripts”, our control over devices that will be giving us opinion/service/suggestions/offers, and the user-generated responses (as if it was a logical diagram) will prevail. To what extent Marketing roles will change? A more strategic take? Fewer resources completely dedicated to tasks? Seniors looking again in the forgotten Branding? I sincerely can’t tell. To start with, the “Next Big Thing” is a major technology shift that PR pros and Marketers must understand well. Not as they do usually …on the surface. Really well! The below General Electric campaign comes from the heavy-industrial company that is now becoming 100% digitized. The film’s story for a hammer that can be activated through coding is true for GE. The company is investing $1 billion every year in new technologies. Today, in the USA alone there are 1.500 AI-only startups developing solutions under a bulk of investment capital of $5 billion only in 2017. They are already working on assisted intelligence for automated reading, cross-check, and validity control of submitted documents at a Bank’s ATM. Until now, a PR launch in search of reviews and product placements entailed issuing “dumb” product samples to influencers and media. What will happen when PR/media pitches to journalists and other influencers will be done through web links, tracked product usage, and AI-powered virtual press offices? A more strategic opportunity I would say is opening, to work again for the Brand experiences on a strategic level through. In a recent interview, at Mobile World Congress, the Global senior digital director of Coca-Cola, Mariano Bosaz, presented the “automated narratives”. No worries dear Digital “gurus” or ad agencies… While Dan Davies, senior VP-director media sciences at MullenLowe (Mediahub division) was saying for long “…of the biggest false labels that I see is applying quote-unquote artificial intelligence to dynamic creative optimization systems…“. Not to say how future-looking is the chatbot “Nirobot” that Interpublic Group has created for their client Kia. What we do know, thanks to a study by Jean Valin on behalf of the CIPR, is that right now 12% of PR skills are being assisted or impacted by AI. Machines are already undertaking tasks such as data analysis, horizon scanning and data management, performed by practitioners starting out in their career. The number is expected to rise to 38% within five years. He predicts that by 2023, AI will impact areas including stakeholder mapping, risk analysis, auditing, and behavioural analysis. Have you heard of Lumiata? It collects data from 160 million “points” (public data, manuals, and product info) to empower and assist doctors and support staff for patient’s diagnosis and healthcare. The systems learn and keep a clinical ‘model’ for each patient. In a recent interview, the Global Credit Risk and Information Management President of American Express, Ash Gupta, reminded us that the company as of 1987 introduced expert systems “Authorizer’s Assistant” where a machine was searching databases to approve credit card excesses. Procter & Gamble’s Folgers coffee brand, in the same way, had introduced expert systems in selecting coffee blends and has saved $20 million per year from OpEx. Do you realize how far is our routine from the transformation and evolution? Coming next? Not only Siri will be saving a boy’s life, but it will possibly suggest which apparel goes well with our daily schedule! The important investments of our life will be decoded and calculated by an advanced system like the one of JPMorgan. And advertising communications will have increased success rates with the “perfect” mix (fun–relevant–engaging–social–helpful). With approx. 39% of Marketers not yet using data to achieve personalization (and 15% believing it is not even possible at all), there is either a lack of knowledge, expertise or technology holding Marketers (and their companies) back from moving to real-time engagement tactics. Machine learning will assist Marketers in homing in on user intent once a new visitor arrives on the page. Algorithms will be able to analyze location, how users arrived on the site, where they visit, and other behaviour patterns to understand this prospect’s position in the buyer’s journey, as well as the particular persona they likely embody. The sites can then personalize this content, the products promoted, and the resources featured to increase engagement throughout the buyer’s journey. Rather than sales professionals acting as the primary means of engaging customers, it will be websites that demonstrate the value of the brand and why customers need to make a purchase from this particular organization. The ability to interact with your Customers (and prospects) in real time, with consistently relevant content and product recommendations, is now becoming a necessity with significant for Companies. Is anyone listening? AI will impact for good the insurance industry. First, we will be talking to “smart” bots instead of brokers. Customer’s voice speed analytics will give more information and insights into the product solution format. Insurance costs will be formed by photos of the insured product or self. AI will contribute to lower the insurance costs for good/safe drivers (reading patterns and databases). Claims will completely change, someday, when insurance agents will revoke their resistance to change; algorithms will read accident photos, geolocation, who’s fault it was, the cost analysis and will provide immediate, real-time remuneration, while drones will cross-check the incident …leading to happy Customers! With a set of AI-powered solutions, Banks will exploit cloud computing to offer: a) language processing, b) face recognition, and c) fast data processing for the Customer’s benefit, time, and security. Banking departments and (today still paper-driven) operations and systems will transform. Departments like Operations, Compliance, Risk analysis, and Portfolio management will use more data, more real-time reports, and more AI (software powered systems) and …less bureaucracy. Imagine that RPA (Robotic Process Automation) platforms can “program” a computer to perform typical, day-to-day works without human intervention. Even personal finances for consumers will change. Within the last 5 years, we have a plethora of apps that help households manage their finances, like Cleo. Gartner report predicts that Artificial Intelligence will be a top-5 investment priority for more than 30% of CIOs by 2020. That investment is going to take many forms, extending beyond the CIO’s domain. There’s a more immediate and realistic issue at hand. Ηow companies can best prepare their workforces to work with ΑΙ, rather than fear it and the hyped idea that they could be outright replaced by it. A Bloomberg article examined the talent gap related to AI. And a study from PwC examining tomorrow’s workforce found that 74% of international workers are ready to learn new skills or completely retrain in order to remain employable in the future. Companies around the world are searching for high-level AI, machine learning and data science experts to build and integrate these technologies. But there simply isn’t enough talent to fill all these openings. We have to ..and we will adapt. But the sooner a Company is planning for Transformation, the better. Otherwise, the “invasion” of the Future will be a violent, disruptive, unexpected(?) reality for the Company, its people, stakeholders and our economies. Technologies aren’t the issue at hand. Education, preparedness, flexibility, learning anew, new skills, and new “Blue Oceans” are the real issues. Global and local economies’ potential will always be about Talent, Opportunities, Open minds, Experimentation and growth, rather than systems.